Arau, the royal city of Perlis is well-known as a gateway to Langkawi and even Thailand. Many tourists and travellers take train especially from Kuala Lumpur to Arau before going to the island via Kuala Perlis Ferry Terminal. In fact, there are many ways to go to the famous island. By train, you can choose either to stop in Alor Setar or Arau depending on your preference. Next, depending on where your train stop, you will have to take the ferry at either Kuala Kedah or Kuala Perlis. Why Take Train to Arau? Going from Arau to Langkawi is probably more convenient compared to going from Alor Setar. If your train stop in Arau, you have to go to Kuala Perlis Ferry Terminal to take the ferry to Langkawi. Since Kuala Perlis Ferry Terminal is the closest port to Langkawi, the ferry ticket price is cheaper and the trip duration is shorter. This is especially good for those who can easily get sea sick while travelling on ferry. Apart from that, taking the train to Arau can also take you to Koh Lipe, Thailand from Langkawi. Check out the summary below for a clearer picture on how to travel to Langkawi by train and ferry. Since Arau is the gateway to Langkawi, the train tickets are on high demand. Booking your tickets online in advance is more convenient and secure. 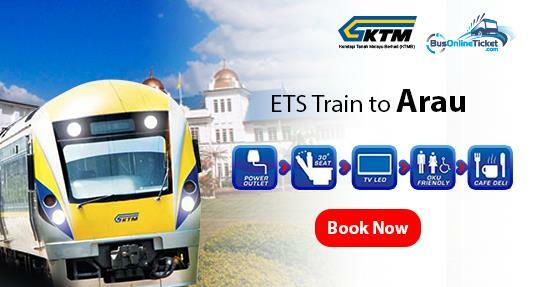 BusOnlineTicket.com offers ETS tickets from many locations to Arau. Below are some of the famous route, the trip duration and the ticket price. If you are taking the train from Butterworth, you can exchange your train at Bukit Mertajam train station. Check out the duration from other location in our train duration page. Arau Railway Station is located in the middle of Arau, nearby the State’s Mosque (Masjid Negeri Arau Perlis). The building was completed in 2014 hence the facilities are still quite new. Being the royal city of Perlis, the new Arau Railway Station design is quite modern with a taste of royal architecture. From Arau to Kuala Perlis, you need to take around 20-30 minutes taxi ride, which cost around RM24. Once you walk out from the Arau train station, turn to your right to get to the taxi station. Bus is not frequent around the train station; therefore taking the taxi is the easiest way to get to Kuala Perlis Ferry Terminal. Ferry from Kuala Perlis to Langkawi runs daily from 7AM to 7PM. However, there might be changes in the schedule depends on the seasons and demands.